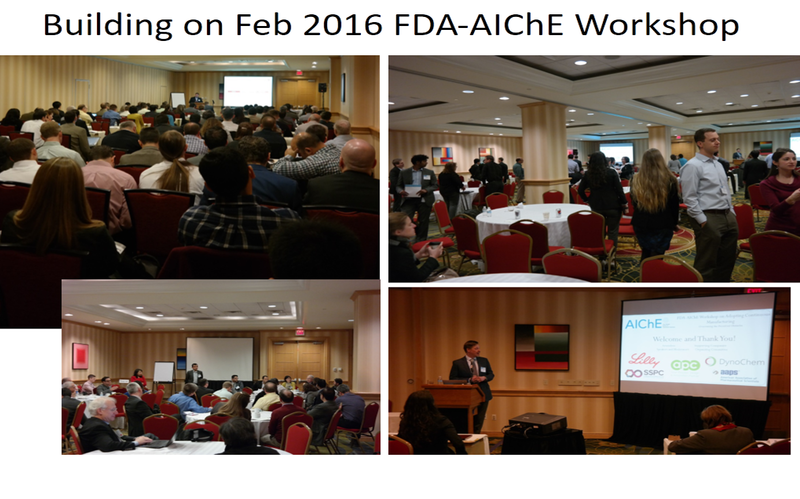 You'll know from previous posts that FDA-AIChE organized a first successful workshop on adoption of CM in Besthesda in February 2016. That is to be followed just under one year later by a second workshop in Ireland on 22-23 February, 2017.
and leading investigators from collaborative research centers worldwide. (Opportunities for) Industry / academic collaboration for shared learning and to address open questions. Those interested in progressing CM filings, the future of pharmaceutical manufacturing and looking to have an influence or make a contribution in this field will find this workshop valuable and informative. We look forward to seeing you there. Online registration and further details of the program will be available shortly. If you'd like more details in the meantime, contact contact co chairs Mark Barrett (APC) and Joe Hannon (Scale-up Systems). Thanks to all the users who worked with us on crystallization projects, especially during 2015, and received training in 2015 and 2016 on the new cooling and antisolvent crystallization toolbox. For our part, we've been making some of the requested enhancements and the latest version includes additional options for automatically generating cooling and/or addition rate profiles to reach specific process goals. If you haven't taken a look for a few months, watch this video preview of the quick design sheets and if that whets your appetite, download the toolbox and take the training exercise.